The PreSonus StudioLive CS18AI mix controller is now available at PreSonus dealers worldwide. 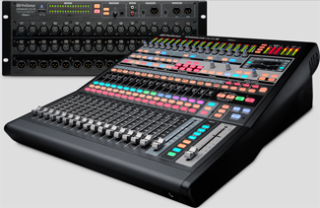 The scalable, modular control surface controls the company's StudioLive RM-series rack-mount, Active Integration digital mixers and Studio One 3 DAW. Networking with StudioLive RM32AI and RM16AI mixers via AVB Ethernet and PreSonus UCNET technology, the StudioLive CS18AI offers 18 touch-sensitive motorized faders and enables complete hardware control of all mixer features, managing up to 32 channels, and features dedicated controls for the RM mixer's Fat Channel processing section. It can be used concurrently with PreSonus UC Surface control software for Mac, Windows, and iPad and with QMix-AI personal monitor-control software for iPhone/iPod touch. With a simple Ethernet connection, the StudioLive CS18AI also becomes the controller for Studio One version 3, giving users an instant hands-on studio upgrade. With the CS18AI, users get touch-sensitive, motorized fader control over Studio One's console and automation, as well as assignable knob control of effects plug-ins. In addition, it provides custom integration not found in off-the-shelf control surfaces, such as RGB LED Channel Select buttons that perfectly match custom track colors in Studio One, Scribble Strips with track names, knobs for dedicated Fat Channel control, and more.